In radiosurgery, the accurate targeting of tumors anywhere in the body has become possible since several years. Current clinical applications manage to deliver a lethal dose of radiation to the cancerous region with an accuracy of about 2-3mm. Nevertheless, the tumour motion (induced by breathing, hearth beat or shifting of the patient) has to be compensated to be able to perform a precise irradiation. Conventional approaches are based on gating techniques, irradiation of tumour at specific phases of the respiration, or increasing of the target volume, until the complete tumour movement is covered. An approach, developped in a collaboration of Prof. Schweikard and accuray Inc., Sunnyvale, CA, deals with this problem by tracking the motion of the patient's chest or abdomen using stereoscopic infrared camera systems. A mathematic model, the correlation model, can be computed based on the information of the external surrogates, which allows conclusions of the actual tumour movement. A robot based radiotherapy system, as e.g. 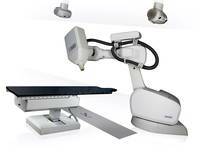 the CyberKnife system, can use this information to compensate patient and respiration movements in real time. A new problem arising from this approach is the fact that neither the recording of the patient's position nor the repositioning of the robotic system is instantaneous. Currently employed systems exhibit delays between approximately 65 and 300 ms. This results in targeting errors of up to several millimeters. The systematic error can be reduced by time series prediction of the external surrogates. Beside the classical regression approaches, as e.g. the least mean square algorithm, current research focuses on machine learning approaches based on kernel methods and statistical learning. The continuous improvement of these algorithms is one main topic of this research project. In our lab, we also measure actual human respiration. To do so, 20 infrared LEDs were attached to the chest of a test person. These LEDs were subsequently tracked using a high-speed IR tracking system (atracsys accuTrack compact). To be able to accurately position the camera and to ensure camera stability, the camera was mounted on a robotic arm. A short sequence of the respiratory motion recorded can be seen in the following movie. Once the motion of the patient's chest is known, conclusions about the position of the tumor are drawn. This is done by using a correlation model mimicking the relation between surface motion and target motion. How this model is constructed and validated is also a matter of ongoing research. Current clinical praxis is the use of three optical infrared markers, which can be placed at any position of the chest or abdomen of the patient. As several studies have indicated, the correlation accuracy depends significantly on the marker placement and on the breathing characteristics of the patient. We investigate how this dependency can be reduced using multivariate measurement setups, e.g. acceleration, strain, air flow, surface electromyography (EMG). Aim of this research is the development of multi-modal prediction and correlation models. Special focus is placed on real time feature detection algorithms to detect the most relevant and least redundant sensors to increase the robustness of the complete system. a) Sensor setup of a multivariate measurement with flow sensor (FLOW), optical marker 1-3 (OM 1-3), acceleration sensor (ACC), strain sensor (STRAIN) and ultrasound transducer (US), b) Example of an ultrasound image and the selected target area (red dot) in the liver, c) mean absolute correlation coefficients and standard deviation of all external sensors with respect to OM1, OM3 and US. Up to this point, surrogate based motion compensation requires a prediction and correlation model. The two models are used in sequence, meaning that the output of first model is used as the input to the second model (the order is arbitrary). Consequently, errors associated with the first model influence the result of the second model. In this context, Multi-Task Gaussian Process (MTGP) models have been investigated. These models offer for the first time the possibility to solve efficiently both problems and within one model. Studies have shown that this lead to a reduction of the total error. MTGP models are an extension of Gaussian Processes models, which are frequently used within the field of machine learning for regression tasks. The essential advantage of MTGPs is that multiple signals which are acquired at different sampling frequencies (even discrete time points) can be modelled simultaneously. The prediction accuracy is increased as the correlation between the signals is learned automatically. Modelling of multivariate signals with arbitrary sampling rates using MTGPs.